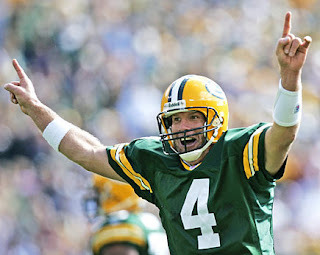 Favre has decided to retire. In January of 1997, my friend Meredith Manners called me up and begged me to come to Eau Claire, WI for the weekend. We'd barhop (I was nervous at the prospect since I didn't turn 21 until June of 1997) and hang out and go to a bar to watch the Superbowl. Because I would have chewed off my right arm to have the opportunity to hang with Meredith for the weekend, I agreed to go, even to watch football. We showed up at some random bar in Eau Claire to watch the game. When we walked in, I was stunned by the crowd. Everyone, I mean EVERYONE, was dressed in Packer gear from head to toe. No wives or children had been dragged along by their husbands. No one was just there to have a drink. If you were in that room, you were a Packer fan. The drinks flowed freely, no one cared that I was 20. When they found out where I was from--Minnesota--everyone in that room made it their mission to have me walk out of that bar a Packer fan. And, what can I say? They succeeded. I became a Packer fan. For eleven years I've stood by my team and its figurehead, Brett Favre. I've watched him win and lose, get pissed off and laugh himself silly. I've watched his passion wane and rally. I've worn my Packer clothing on win days and loss days. I've taken verbal beatings, had drinks thrown at me, been booed...it's tough being a Packer fan in Minnesota. But, I love Brett Favre. And I love his (former) team. I think he made the right decision. His reasons are sound enough for me, and I'm not sorry that he's done. I'm sad, I'll miss him, but he's going out a Champion and that's exactly what he should do.